Dog separation anxiety medication can definitely improve quality of life for anxious/fearful puppies and dogs. It can be difficult to completely cure a dog of separation anxiety but you can definitely reduce his level of distress with natural products or prescription medicines combined with behavioral modification. It's also helpful to know that the treatment for anxiety in dogs is similar whether the problem is general canine anxiety, separation stress, or situational/specific fears such as fireworks, car travel, thunderstorms etc. Use these two quick links to jump to the type of product you're most interested in or simply scroll down to get the big picture. 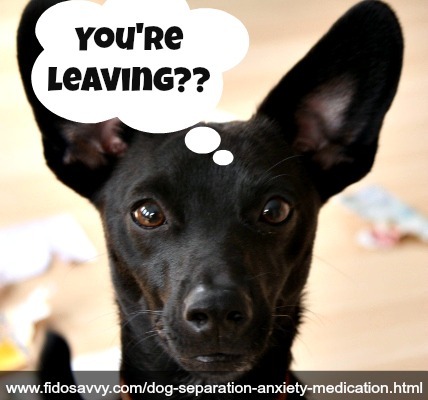 For the small percentage of dogs who suffer from extreme separation anxiety your veterinarian may prescribe an anti-anxiety medication, an anti-depressant or a sedative. Prescription medications can interact with other products your dog is taking, either prescribed or OTC, so always make sure your vet knows about anything else you're giving your pet - including natural, herbal or homeopathic products. This is what's called an SSRI drug (Selective Serotonin Uptake Inhibitor) which helps control anxious and OCD behavior (which includes separation anxiety) as well as depression and aggression. Fluoxetine is one of the few medications that the FDA has approved for treating separation anxiety in dogs, and one of the most popular ones. For best results it is recommended that you use in in conjunction with behavioral modification techniques as I talked about earlier. Potential side effects include drowsiness/dizziness and digestive upset or loss of appetite. Also, this type of medication can sometimes have the opposite effect to that intended! Increased hyper-activity, restlessness or an increase in anxious behavior is possible and obviously if that happens you need to talk to your vet right away. These should diminish as your dog's body adjusts to the drug. The biggest worry with this drug is that it can have serious implications if it is taken at the same time as some other medications. Make absolutely sure your vet knows of any medication or natural treatment or product that your dog is also taking! It can take several weeks for improvement of symptoms to start as it takes a while for the medication to build up in your pet's body. Fluoxetine isn't designed to be taken indefinitely, or for a long time, but by combining it with behavioral training the short-term use (perhaps 3 - 6 months) is usually enough. 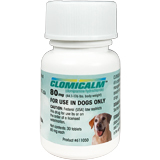 Clomicalm is an FDA approved tri-cyclic anti-depressant that's usually used to treat all sorts of behavioral problems in dogs, that stem from anxiety or fear, including aggression, scent-marking, OCD behaviors (such as spinning or tail-chasing) and of course, canine separation anxiety. The active ingredient Clomipramine Hydrochloride works by increasing the levels of serotonin in your dog's brain which reduces the feelings of stress and anxiety, and is sometimes called 'Puppy Prozac'. Of course as with all drugs there are potential side effects and these include digestive upsets such as vomiting and/or diarrhea, increased thirst, and can also lead to more serious and long-term liver problems. Your dog will may need regular blood tests while he takes this medicine, to make sure that it doesn't have any ill-effects on his body. Clomipramine can interact badly with other medications or natural remedies, so be sure to discuss anything else you are giving/want to give, your dog. It is not suitable for dogs with certain health conditions and your veterinarian needs to have a full health history in order to prescribe this safely. Also, if your pet has ever had a seizure or has gluacoma this is not the drug for him. Clomicalm may cause your dog to be a little dizzy, or drowsy, but it doesn't usually have a significant sedative effect. It can take several days, or a week or more for the full effects of this drug to show up (both positive and negative) and for your pet's system to adjust to the medication. 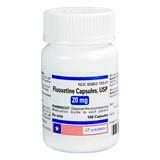 This is a tricyclic anti-depressant which is also used to treat anxiety disorders, including separation difficulties. Amitriptyline also works on your dog's brain chemicals, putting them back into 'balance' and reducing the symptoms of fear, stress and anxiety. Minor side effects include drowsiness (sedation), dizziness, loss of appetite and sometimes difficulty urinating or a rapid heartbeat. 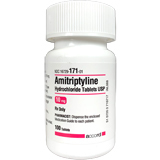 Amitriptyline can also react adversely with many other drugs or products, so double-check everything with your vet. It can start to be effective more quickly than the first two dog separation anxiety medications above, usually within about 2 weeks. The following options are gentle, natural medications or treatments which will help to calm your dog and reduce his anxiety without the use of sedative drugs. For the majority of dogs who have mild to moderate dog separation anxiety, these products alone or combined with behavioral modification and training methods (learn more here) can work wonders. Let's start off with the products or treatment that reduce separation anxiety as well as general dog anxiety levels, gently and naturally. Obviously not every remedy or product works for every dog. It can be a bit of trial-and-error before you find what works best for your dog in each situation. Depending on the length of time you're away, whether or not your pup is confined, what type of anxiety symptoms (and to what degree) he shows you can often use more than one treatment at at time. ALL medications or natural remedies work better, and faster, if you also work on helping your pup overcome his fears with behavior modification and training. For instance you can use a natural food supplement or essence and a pheromone diffuser, or calming treats and a pheromone collar. Don't ever combine natural products with prescribed medications without consulting your veterinarian first! It could have very dangerous, even potentially deadly, consequences! Dog relaxation CD's - these make a great addition to your efforts to calm your dog and can be quite miraculous. A Thundershirt - which uses uses gentle, continuous pressure to help calm your dog, making him feel safe and relaxed. Any of these gentle, natural products could help your anxious dog (no matter what the cause) feel better, without the side-effects of mainstream medications. All natural supplement containing certified Colorado hemp extract, organic hemp seed oil and cod liver oil. Gentle and non habit-forming, this liquid helps to reduce anxiety, stress in dogs. No side effects, can be used daily. Drops are easy to add to your dogs food. All natural formula which includes Chamomile, L-tryptophan and Melatonin. Formulated by veterinarians. Manufactured in the USA. Helps to reduce stress and anxiety and calm overstimulated behavior. Tasty chewable tablets for ease of administration. This 100% natural herbal and homeopathic remedy helps to reduce anxious behaviors and relieve fears and stresses. Granules can be dissolved in water or sprinkled on your dog's tongue. Helps with all types of anxious behavior whether caused by noise, travel, separation and more. Add a few drops to your dog's food, water, a treat, or directly onto his tongue. Made in the USA. A recent veterinary research study found that supplementing an anxious dog's diet with Omega-3 fatty acids reduced symptoms by up to 50% for 87% of the dogs tested. Omega-3's have routinely been recommended by veterinarians for older dogs suffering from certain mental or physical conditions for quite some time. Now that usefulness can include conditions such as anxiety, fearfulness and even some OCD behaviors. Pheromones are natural chemicals that a momma dog produces to calm her puppies. Her pups smell it and relax. It's a great way to reduce dog separation anxiety, especially in puppies, and is also effective in a whole range of situations. The following products all reproduce this chemical scent 'signature' and are a very gentle way to reduce stress and calm your pet. It's worth noting that they aren't a 'quick-fix' like the way the essences/products above are. A pheromone-based product may take a few days to being working. But it's worth the wait. Pheromone products release natural calming (odorless to humans) pheromones into the air surrounding your pet, calming him gently and naturally. Simple plug-in diffuser can be used in any room to comfort your pet. Excellent for puppies, and dogs of all ages. This pheromone spray works in basically the same way as the diffuser above. Versatile product can be sprayed on your pet's bedding or clothing, on furniture, in the car, on a blanket in his crate. Recommended for use with Pheromone diffuser and/or collar for separation anxiety. Keep your pet cocooned in his own little bubble of relaxing pheromones with one of these collars. Clinically proven to reduce stress related behavior in dogs. This collar works on the same principle as the pheromone products above, but goes wherever your pet goes. Safety warning - it's not recommended that you leave any collar on a dog who is crated and unsupervised. I'd recommend using the diffuser/spray when you're gone and the collar when you're home. There are a variety of different dog treats which are formulated with ingredients to help reduce anxiety. These can be a very quick and easy way of 'taking the edge off' when your dog is anxious or stressed. The only down side here is they're not great for long periods of anxiety and there's a limit to the number of treats/tabs/wafers (usually only 2 or 3) that you can give per day. Chewy treats that your dog will enjoy, even as they help him feel less worried. Natural ingredients help reduce anxiety, irritability and hyper-active behavior. Will make your pup 'mellow' and relaxed, without seeming drugged. Tasty liver flavored bite-sized chews with 3 special ingredients to help reduce your pet's anxiety levels. They will calm him and reduce hyperactive behavior without making him drowsy. Good for all types of stressful situations. Chicken flavored soft chews containing natural herbal ingredients plus L-Tryptophan. Can reduce anxiety, improve mood, alleviate travel sickness and more. USA made in an FDA approved facility. The best way to help your dog is to make sure you understand his separation issues. You may want to check them out so that you can be sure to choose the right treatment plan/products. A safe & effective way to calm your dog and reduce anxious behaviors!